We have built an outdoor skating rink for everyone to enjoy. Please come and join us every weekends during the winter (weather dependent) and get your skate on. There is no cost to come out for some fresh air skating. No experience required either. Just some good old Canadian fun. The rink is located beside the market near where the petting zoo is. There is a little shed for you to lace up, before you head out. The only rules are children under the age of 18 must wear a helmet and be accompanied by an adult, and sorry not hockey sticks or pucks. Other than that we would just like everyone to have some fun and spend some time outside this winter. Its a great spot to bring the family for a winter activity or to learn how to skate. There will also be an outdoor campfire pit to warm up beside. After you skating you welcome to come into the market and warm up with some delicious hot chocolate beside the wood stove in the store. We hope to see you and your family out of the rink with us. Its a great place to learn to skate too. 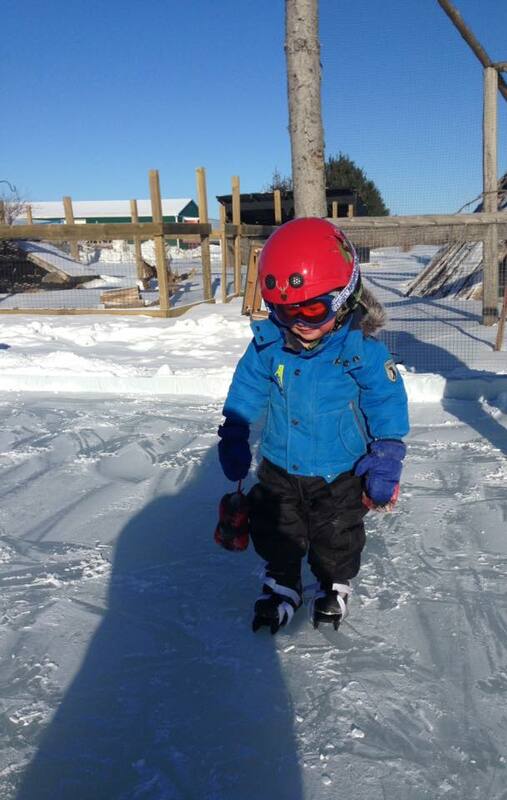 Ian has been testing the rink out and his new skates. So far he loves skating and asks to go out each day, so you might see him out there. Look for the little guy in the Red helmet and googles, with bob skates who thinks he owns the place. Cause already at 2 he is running the farm in his mind and every thing around here is just for him. But don’t worry he loves to share and would enjoy having more kids on the rink with him to play around with. If you are wondering about the ice conditions please call ahead and we will let you know 905-985-4973 or check our Facebook page. 4 Comments on "Join us on the rink for some skating!!" we are adults in the area, who are looking for a place to skate, for fun. like the “old days so to speak. If you have a rink..we would love to skate. We do have a skating rink! It is free to come and have a skate, just like the old days! We are located at 975 Regional Road 21 in Port Perry, ON.